When I was young I loved to go into the woods alone when the snow was deep and fresh. You could sit on a rock or just stand very still beside a tree and listen for the slightest sound, the shush of snow falling off an evergreen or, when it was very cold, the booming sound of expanding or shrinking ice cracking on the lake. It was in the snow-belt of Northern Ontario where heavy snow would build up foot after foot until the spring breakup. Winter was more than a challenge, it was also fun. One year the ice on Lake Temiskaming froze solid during a period of no wind and almost no snow. Out came the ice skates and we would skim along at high speed for miles, exploring the shoreline and racing one another. Occasionally you had to hop over a pressure ridge where the ice, expanding as it froze, had cracked and buckled upward. It was the largest skating rink ever. The woods, we called it bush, stretched away across the Canadian Shield in all directions. That forest wasn't a dark and scary place for us. It was a place of adventure where a young heart could get away from parents, build tree forts, and play all sorts of games. It fostered independence, self-reliance, and uncommon imagination. It also engendered cooperation as the older boys looked out for the younger ones. Even at ten or eleven years old we would hike off into the bush with axes and knives, hammers and nails, and build the most amazing structures high up in the trees. There were stories about adult hunters who went into those woods and became lost, showing up days or weeks later starving and haggard. But we never got lost. We unconsciously tracked our position from the West Road or the Northern Ontario Railroad line and at the end of the day always knew in which direction to find our way back to town. It was a time when parents had some trust in the world and their children. In summer a group of us would hike way off into the woods with the usual admonition from mothers to be "back for supper". We didn't fear for climate change or pollution. We weren't afraid to be children. We were having too much fun. Life was an adventure. The books of Jack London like White Fang, or Call of The Wild, were read and reread. Winter was different. You couldn't go far without snowshoes. I had leather mukluks over layers of socks that kept your feet amazingly warm. Style was not an issue with our parkas, toques and mitts. Practicality was paramount. A temperature about zero (Fahrenheit at that time, minus 18 Celsius) was pretty normal and provided excellent conditions for a hike in the woods. You could judge the temperature closely by how squeeky the snow sounded when you walked on it. One needed to be much more careful when the temperature plunged to the proverbial "twenty below". We weren't foolhardy though, just adventurous. A good distance into the trees the silence would be complete. I'd stop, close my eyes and listen, controlling my breath. Gradually my ears would adjust and start picking up the tiniest susserated ripple of sound. It was like going out on a moonless clear night with millions of stars and finding that you could see just fine as the eyes adjusted. The body is amazing that way. The primitive capability of our senses is still present. The hunter instinct survives somewhere in our genes. In the woods I could imagine being an explorer or hunter, stepping carefully to not make any sound and practicing being aware of everything around me. It was an exercise of widening one's conscious perception, pushing out the boundaries of normal awareness. My breath and heartbeat seemed loud. You became aware of life in the forest, the patience of trees, the gurgle of water in a tiny buried rivulet, everything. These experiences shape the young mind, changing how you see the world. Most of us today live in cities. Here the sound of our hydrocarbon civilization plays a continuous droning background cacophony as we rush through life, our senses dulled by constant boundless stimulation. 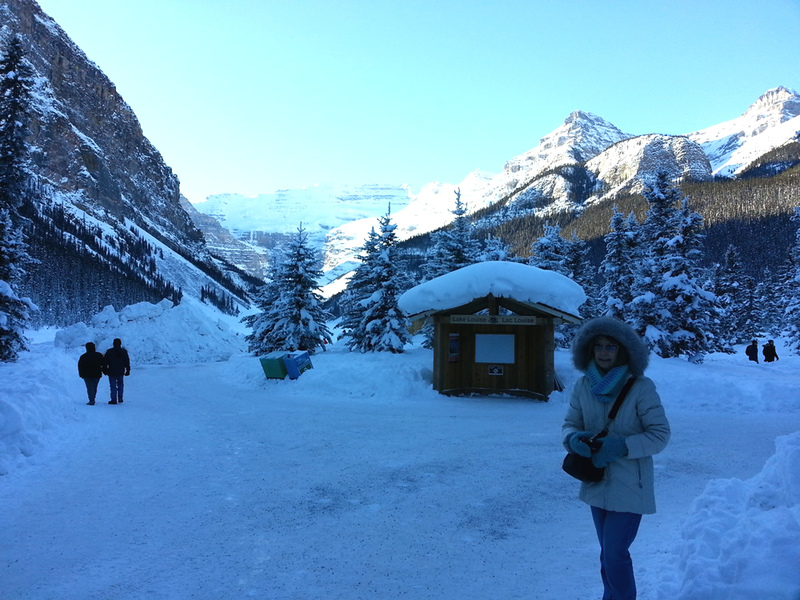 Recently we escaped to the mountains, visiting Lake Louise on a cold sunny day. The beauty of the view was spectacular. A few people were skating on the rinks where the staff had cleared snow from the lake. The ice bar was set up but not operating. I jogged a short way on the lake trails, relishing the clean frigid air. But the cold soon drove us into the Chateau for a pastry and latte. It was a long way from sitting alone in the deep snow of a Northern Ontario forest.